Call us today & have our expert team take care of your roller shutter needs. Trust to locally owned and experienced team. Have the design and style to fit your budget, call the team today. Talk to the team today to request a quote. Whether you are looking for heat, light, noise control or extra security, you will find your solution within our range of window roller shutters. We have the full range of colours, operations and even a low-priced shutter to suit a limited budget. To find out more visit our Wangara Showroom or call one of our trained technicians for a free measure and quote. Our Horizon Roller Shutters are the most maintenance-free shutter on the market. Designed, manufactured and sold exclusively by Mr Rollershutter, they are the culmination of decades of experiment and experience. Our objective in its creation was to manufacture a shutter that would, for many years, retain its ‘brand new’ look while also functioning with the lowest failure rating. Thereby offering you best long-term value for your money, and also allowing for today’s busy lifestyle. Now, when lasting quality matters, our customers choose the Horizon Roller Shutter. It’s constructed from Oz Roll Aluminium Coils which are produced using the world’s best manufacturing standards available. 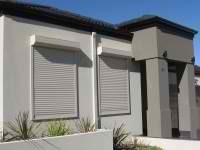 To view our window shutters in Perth, visit our Wangara Showroom, or speak with one of our trained technicians to find out why our Horizon Shutter is a better built, better installed and better maintained roller shutter. Roller shutters are installed to the outside of your window, but are controlled from inside your house. With this top quality shutter your choice of operational styles includes: Manual, Electric, Low Voltage, Solar, and Remote. External Security Keyswitch and Battery Backup Systems are also available. When closed, your rooms are dark (perfect for shift workers and nurseries). As you raise the shutter, small ventilation holes appear allowing filtered light and cool breeze to enter. From there you can fully open the roller shutter or stop it at any position in between.